DBT was developed in the 1970’s by Dr. Marsha Linehan. Dr. Linehan had personal experience with mental illness. DBT was the first psychotherapy to formally incorporate mindfulness. 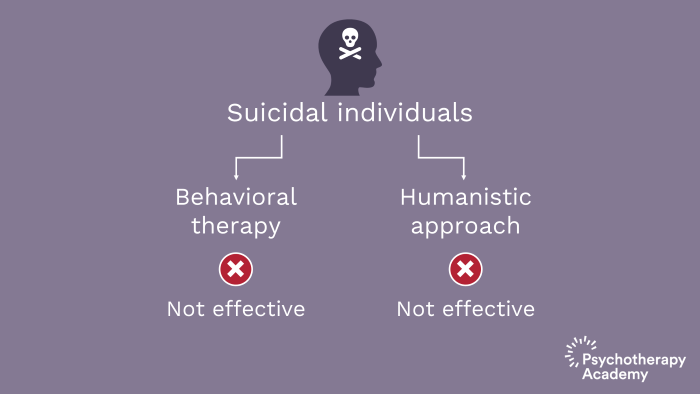 DBT is not just for severe populations. DBT balances CBT and humanism with dialectics. My name is Stephanie Vaughn and I’m a Clinical Psychologist in Nashville, Tennessee. 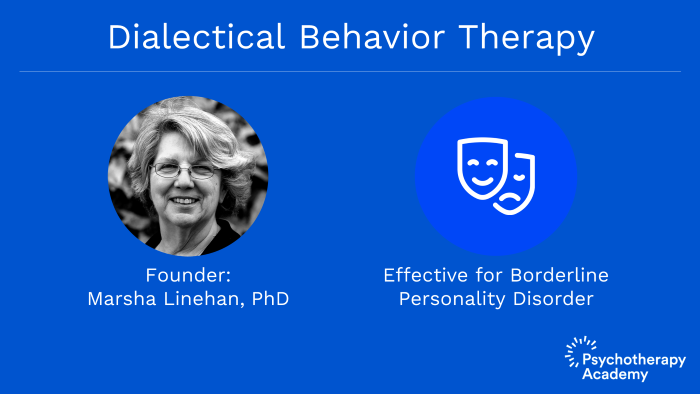 I am a Dialectical Behavior Therapy–Linehan Board Certified Clinician and I own a private practice in Nashville in which we conduct DBT as much as possible to fidelity on adolescents, adults and families in addition to other cognitive behavioral therapies. I founded and continue to run the Vanderbilt University’s Dialectical Behavior Therapy Peer Consult Team and serve as a consultant to a variety of hospitals and schools. I am an Affiliate Professor of Vanderbilt Psychiatry and an Associate Professor of Vanderbilt Counseling Program. DBT was originally founded in the late 1970s by Marsha Linehan who was a suicide researcher at the time. She actually did not know anything about borderline personality disorder but came to find out about later. DBT is well known for treating borderline personality disorder. Linehan found that there was support for the use of dialectical behavior therapy with borderline personality disorder but today it’s almost a faux pas to suggest that DBT is only used to treat borderline personality disorder. 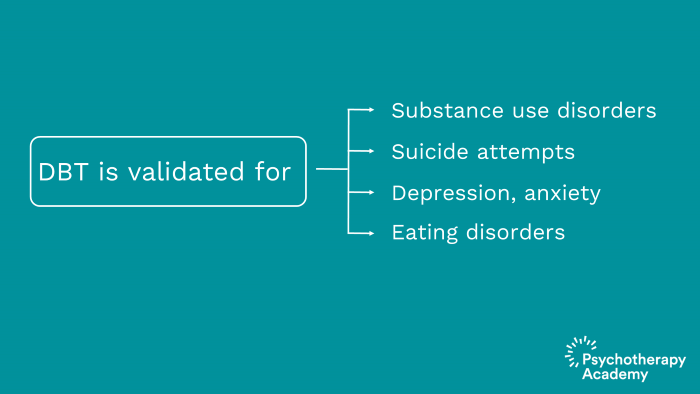 In fact, it’s been empirically validated for a variety of different populations and issues including substance use disorders, suicide attempts, PTSD, self-harm, symptoms of depression and anxiety, eating disorders, that’s including binge eating and bulimic tendencies. There is less evidence supporting anorexia. Frequency rate and length of hospitalization have been shown to decrease repeatedly in different studies that have been conducted on DBT. 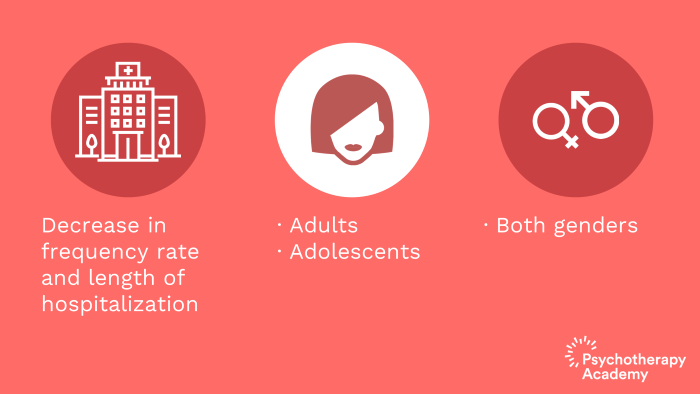 And it’s also been supported with not just adults but with adolescents. Women are the primary gender in which DBT has been supported with but there has also been some evidence that it’s helpful with both genders. And so it’s no longer associated just with borderline personality disorder in women. In the ‘70s when Linehan first started working with suicidal individuals, she tells about how it was easier to get grant money because she was the only one who was doing randomized controlled trials with suicidal individuals. Her research team would call the hospitals in the area and ask them to send her the most severely suicidal and self-injuring populations and they would do so. And she would try to, as she says, cure them with behavioral therapy. But what she found was not only it wasn’t enough but oftentimes it was extremely aversive to the patient and they would quit treatment and they would get angry. 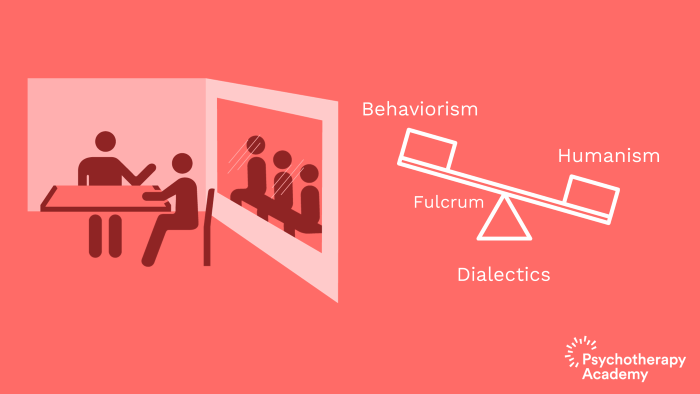 In the ‘70s and ‘80s, behaviorism was popular but also the humanistic approaches were also dominating at the time. And so she thought well, maybe there’s something to this humanistic approach. Behaviorism has a reputation for being fairly sterile and cut and dried. She was willing to take a step back and consider that this other approach, humanism, would be more an appropriate stance. And so she tried it. And that didn’t go well either. If we look at humanism or the humanistic approaches as being at one end of the continuum and we look at behaviorism as being at the other end of the continuum, they’re fairly opposite. And so she went from one treatment to another almost in a black and white fashion, from one end of the continuum to another and found that neither was effective. And so Linehan very much wanted to help this population. She had her own struggles with mental illness. She came out in the New York Times over the last few years and acknowledged that she had severe mental illness when she was in her late teens. 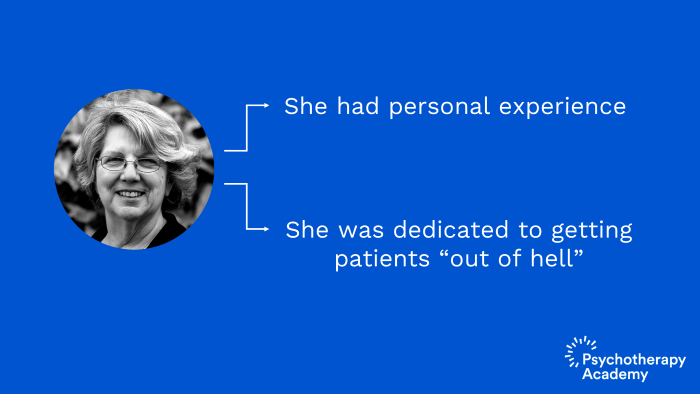 And she’s one that had a personal interest in helping all of the patients that she saw. And so she was dedicated to, as she would say, getting them out of hell. She felt like the population she was working with was in hell and she wanted to be able to get them out any way that she could. So she wasn’t particularly tied to a model of psychotherapy. When she was trying behaviorism, the patients would respond feeling like the therapist was saying that they were the problem. Behaviorism is the model of change. When she would give feedback about ways that they could change and improve their symptoms, they felt like she was saying that it was all their fault. So the response was: What are you saying? This is my fault? What about my employer? What about my kids? What about my spouse? What about the environment that I’m living in that makes it extremely difficult for me to get better? And in trying to figure out what works, she had her research team watch through a one-way mirror so they could see in and Linehan and the patient couldn’t see them. And they would take notes. Linehan would just try to do what worked. So she would do a little of this and a little of that and the team would take notes. And what they found was with certain things that she would say or do the patient would get upset and then other things seemed to be more regulating. What they found wasn’t a third theory. It wasn’t something totally different. It was more of a movement or a blend of the two. So instead of doing just behaviorism, instead of doing just humanism, we were moving back and forth between the two. But the fulcrum between the two, the thing that helped to balance those two seemingly opposite theories was dialectics. The origins of the theory involved a non-pejorative stance. Instead of painting the patient as the problem or calling them manipulative which is a typical pejorative term that’s used with individuals with borderline personality disorder, the approach was one of equals between therapist and client. Her balance between CBT and humanism was also influenced by her Zen training. DBT was actually almost called Zen behavior therapy. Linehan is now a Zen master. And when she was training back then, she found that a lot of the principles she was learning in Zen and in her meditation were applicable to her population and mindfulness being one of them. The key points are as follows: DBT was developed in the 1970s. Linehan had personal experience. DBT was the first psychotherapy to formally incorporate mindfulness. DBT is not just for borderline personality disorder or severe populations. 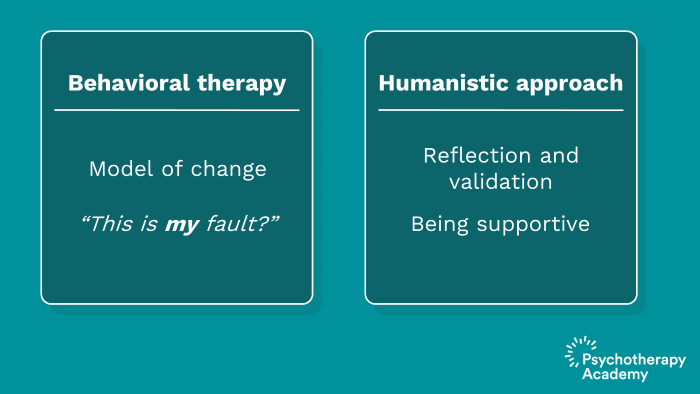 DBT combines strategies from cognitive behavioral therapy and humanism. DBT balances CBT and humanism with dialectics. There is a heavy zen influence in DBT.